Well the guys are glued to the TV watching the football game, and I wasn’t very interested in it at all. So I decided that I was going to make a some things for supper and then have leftovers for the week. We’ve got quite a few things going on this week and it’ll be nice to have stuff in the fridge to just warm up quick and go. So I took some turkey out of the freezer and warmed it up and made some gravy. Then I made a Tator Tot casserole and since I had the oven on, I thought I might as well make some baked potatoes for the turkey if they wanted to put it on it. And it’s a waste to have the oven on if you don’t make cookies isn’t it? So a batch of chocolate chip cookies are also on my counter now. Then William wanted to show me a new recipe that they made at school. He’s involved in a Food and Fitness program, so I thought it really couldn’t hurt to try something that might be a little bit better for us than what we might eat. Since I went to get groceries today, I picked up what was on this list of his. 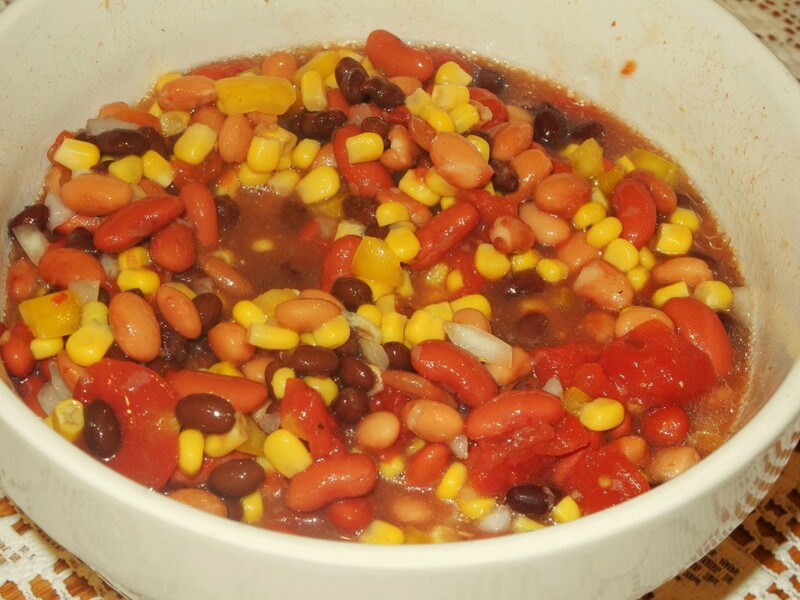 What we were planning on making was a Bean Salsa. Now I’ve only bought pork and beans at the store and to be honest, I really don’t even like them even if they have with tons of bacon and brown sugar in them. So this really was a stretch for me. I was looking for beans that I’ve never even heard of before. But after what seemed like a lifetime just trying to pick out the right kind, I did get them in my cart and home I went. After we opened the first couple of bean cans, I was starting to second guess this decision. I mean, if you have never seen a can of black beans before – it’s not a pretty sight. I asked William if they are supposed to look like this? And I guess they were. I started to think about the last time that I ate beans (other than the pork and beans) and it was way back in high school. It was a double dare at our school lunch cafeteria, and if I ate them I could go to the front of the lunch line. Now I can see that this was a really dumb bet, but at the time this sounded like a good idea – – Wrong! I took the dare and I’m not sure what these beans were, but they might have been refried beans or something. How I remember them was a big pile of somewhat warm, pasty, a little gritty, brown mud. But I didn’t want anyone to think I was a chicken and ate them. I had to do everything to keep them down and then off to the front of the line I went. I was trying to act really cool, but what I remember was that when I was walking up to the school kitchen, I had this terrible feeling that I was going to throw up. You know when you get that kind of wet feeling in your mouth? Well I didn’t throw up, so I just got some buttered bread and called it a day. So with this past experience, I was just a little bit worried on how this bean salsa was going to go. We worked together to get it mixed up and then the big test – digging in. Maybe it’s called maturity or maybe it was a change in taste – but I really liked the salsa. Who would have known? I guess it’s really high in protein and it’s the snack that you can eat just about as much of it as you want. We dipped tortilla chips into it and it was good. I really think I’ll make it again. Hi! Good idea on the laptop! Just make sure that the fan is exposed…you don’t want a fire…that would not be good. After you mentioned about the fan, it made me think that I’ve never heard the fan run on this computer. Now maybe that couldn’t be good could it? 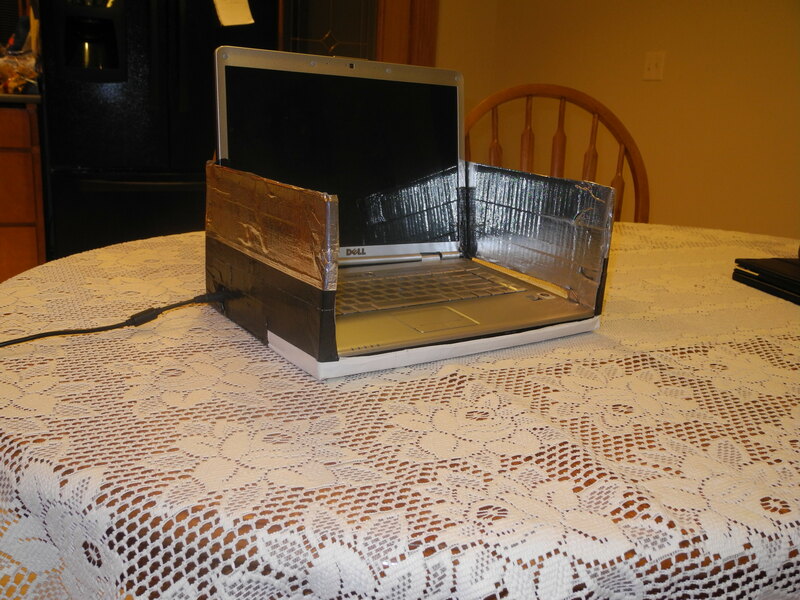 You just might be a redneck if your computer is held together with duct tape. You know – I think that just might be on one of those Redneck jokes! But you have to admit – my little laptop case is looking pretty good! necessity is the mother of invention! that ‘puter is stylin! hahaha. that SO looks like something i would do. the bean salsa looks pretty good too! do you think you might share the recipe? i could use something healthy to eat after all the junk i just ate during the superbowl! Tammy, I posted it on the page under recipes. If you don’t see it, let me know.